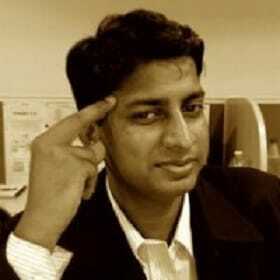 Vinish Garg is a Strategic Story Designer. He works with product teams to ensure that they make right investments in their UX and content processes, for a shared understanding of business goals and customer success goals. Organizations communicate their brand story around their customers. Customers have their own story to interact with a brand. Vinish helps customers live their story in the product, for the right customer experience goals. Know more at his website. When I was studying computers, I did not find it interesting. During my college days, I used to write for national newspapers. While looking for my first job in January 2005, the title *Technical Writer* caught my attention because it gave me the best chance to bring writing and technology together. I got selected and this is how it started. By 2007, I moved to another company where I was writing proposals and B2B content for marketers. I studied how some of the leading tech comm folks in the world were doing, and I read idratherbewriting, everypageispageone, thecontentwrangler. By 2009, I was blogging, and I learnt about content strategy. In 2010, I was doing information architecture and added a UX orientation to my content strategy projects. Blogging and engagement with community (such as LinkedIn groups) helped me stay connected with international practices and standards in content and design. In 2015, I made ContentHug, and it was a great experience in product development as a maker. Now, I work with global product teams as a strategic story designer. I work with founders to craft their product story in their product design (plus strategic content), and to align their business goals with customer success goals. Your story is your most important asset when you are seeking work. Do not follow the conventional resume formats with an objective and a list of skills and projects. It just does not sell because it does not inspire confidence across the table. Craft your story for how you as a role are a good fit into the organization’s story. First know their story, and then identify the reasons of why you can contribute to it. Then sell it. A resume is a simpler way but a story is a workable way – the choice is yours. Do not evaluate a candidate by their skills framed in tools or in past projects. It was never important. Tell them what your organization wants to achieve, how different people and teams are working towards that goal, and how the new candidate can contribute there. Evaluate it for culture-fitness, learnability, adaptability, leadership, ownership, and for the excitement for the open position. Seek alignment in what the organization wants (and can offer), and what the candidate can contribute (and can get). Three most important ways to evolve as a professional are reading, writing, and speaking. Ideally, you should be doing at least any two of these three. Use utilities like Refind, Revue, Nuzzle, or Medium of course. Once you will read, you will feel like sharing your own experiences. Start writing, it was never so easier. Offer to participate in meetups, or community events of your interest. Engage, volunteer, identify some role models to emulate, talk to them (with all etiquette of course), and propose to speak at technology events. All your actions and interactions should be personalized. For instance when you want to apply for an open position, know the company’s history, their products and services, and read their recent blog posts and insights. In your application, you can use some of this awareness to co-relate for how you are a good fit for whatever the team is trying to achieve. I am hundred percent convinced that you can always setup the right context in your application. Personalize all communication, my post on LinkedIn Etiquette is valid for emails of course when you are seeking a new position. Be polite, and thankful. Cite references and sources where required – gratitude is so important. You can make your best investment by surrounding yourself with amazing people, in your city as well as online. Talk to them, engage, and learn from their work. Ask questions, and this should quickly widen your work perspective for better. This is what helped me at every stage of my career so far, and it should work for anyone. Over to you now.